Pain-induced changes in the brain’s opioid receptor system may explain the limited effectiveness of opioid therapy in chronic pain and may play a role in the depression that often accompanies it, according to a study from the NIH’s Intramural Research Program and McGill University. Although the study, published in the journal Pain, was conducted in rats, and the results of animal studies may not be directly applicable to people, the findings provide new insights into how the brain may respond to pain and opioids. Previous research in people with chronic pain has shown that they have reduced availability of opioid receptors (the molecules opioid drugs bind to) in the brain. This decrease may explain the limited ability of opioids to relieve chronic pain. It has been uncertain if the brain changes are due to chronic pain itself, or whether they reflect effects of pain treatment or preexisting differences in the brain that might predispose some people to develop chronic pain. Another poorly understood phenomenon is the decreased ability of some people with chronic pain to experience pleasure. A diminished ability to experience pleasure is a symptom of depression. 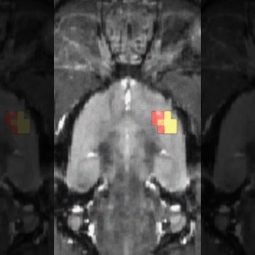 In this study, cross-sectional positron emission tomography (PET) imaging was performed on the brains of 17 rats that had undergone surgery to produce a nerve injury that causes chronic pain, and on 17 rats that had undergone sham surgery (a similar procedure that does not cause chronic pain). Three months later, the availability of opioid receptors had decreased in multiple regions of the brain in the nerve-injured rats, but no changes had occurred in the sham-surgery rats. The results showed that pain itself, not treatment or preexisting individual differences, altered the brain’s opioid system. Other tests performed on the rats provided insight into the relationship between chronic pain and depression. In the study, the injured rats also showed a decrease in their preference for sugar water over plain water after injury. (Rats normally enjoy sugar water, so this test provides insight into the animals’ ability to experience pleasure or interest in seeking it.) Among the injured animals, there was a positive correlation between opioid receptor availability and preference for sugar water (i.e., within this group, those with more opioid receptor availability had a greater preference for sugar). The results of this study suggest that pain-induced changes in the brain’s opioid system may at least partially explain the limited effectiveness of opioid therapy in patients with chronic pain. Changes in the opioid system may also play a role in the depression often associated with chronic pain. These findings, if confirmed in people, will enhance the understanding of the impact of chronic pain on the brain, its relation to depression, and the effects of opioids. Thompson SJ, Pitcher MH, Stone LS [McGill], Tarum F, Niu G, Chen X, Kiesewetter DO, Schweinhardt P, Bushnell MC. Chronic neuropathic pain reduces opioid receptor availability with associated anhedonia in rat. Pain. May 22, 2018. [Epub ahead of print].